Institut Paul Bocuse (School of Hospitality Management Food Service and Culinary Arts) trains more than 1,000 students each year, representing 55 nationalities studying on 10 international campuses. From undergraduate through to doctoral level, our courses benefit from an innovative teaching approach recognised by the 2017 Worldwide Hospitality Awards. Our Institute is also a member of the elite Conférence des Formations d’Excellence du Tourisme (CFET). The Director of Master programmes, Martine Ferry, has just received the Eduniversal Trophy from the pedagogy category: “Sector management : Art, Culture, Luxury, Sport, Tourism, Gastronomy, Health” for the Master in International Hospitality Management in partnership with the emlyon business school. The Anglo-Saxon expression “Food service” refers to what is more commonly known as out-of-home catering. A booming sector of activity, Sirha and Food Service Vision have identified the 7 trends of tomorrow’s catering industry: flexibility, responsibility, naturalness, local proximity, globalization, practicality, and places of emotion. 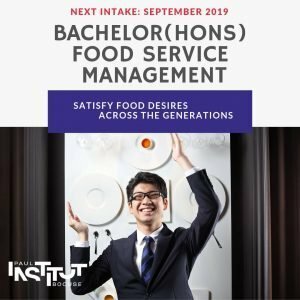 The Paul Bocuse Institute prepares young people for these professions of the future with the Bachelor in International Food Service Management. Read the trends about food service here. Find our training courses in the Hotel Industry, Culinary Arts and Catering as well as your online registration form here.